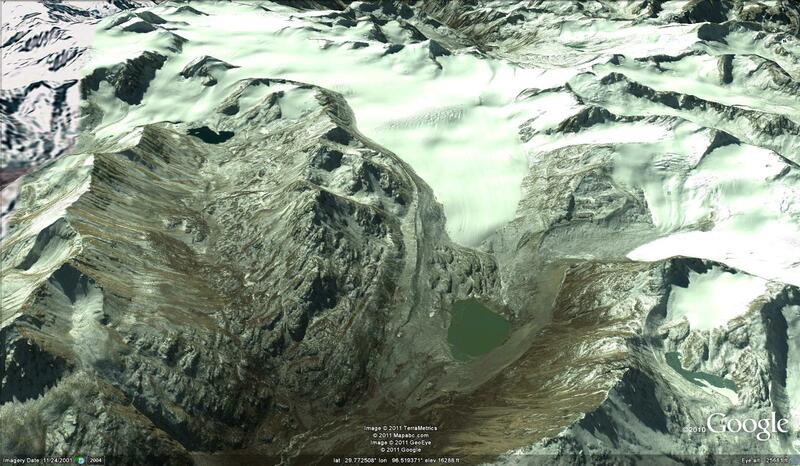 Increasing number and area of glacial lake in the Boshula Mountains, Tibet. Wang and others (2011) note that Glacial lakes have expanded from 1970-2009 by 19 % and the area that is glacier covered has decline by 13% during the 1970-2009 period in the Boshula Range. An examination of one unnamed glacier in this range illustrates this pattern. The glacier currently terminates at 4820 meters, the top of the glacier is at 5560 meters. The glacier terminated at 4660 meter during the Little Ice Age. The glacier has retreated 1950 meters from the evident Little Ice Age moraines and 670 m from the edge of the lake that is beyond the glacier terminus. 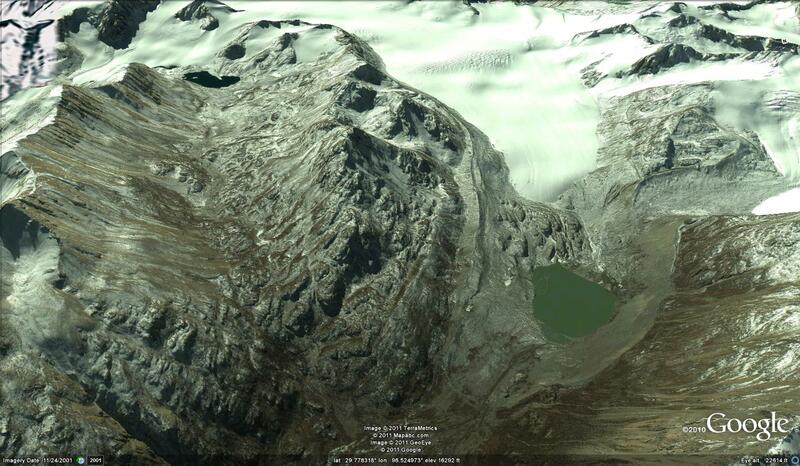 The glacier was almost to the shore of the lake in 1970 and has retreated 580 meters since then. The glacier was also separated by only a short distance from a tributary glacier that has experienced a 700 meter retreat since 1970, seen in the second image below. By comparing the height of the lateral moraine at the glacier terminus and at 5200 meters the amount of thinning can be identified. 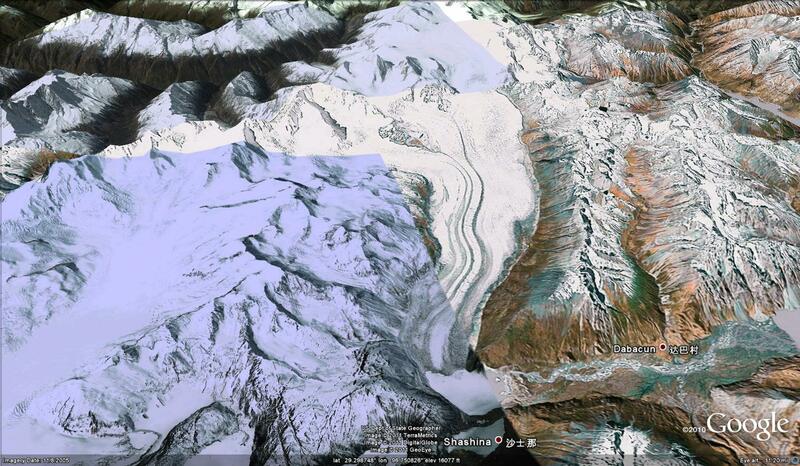 Thinning of the glacier is 140 m at the terminus and 60 meters at 5200 meters. Melt season temperature and accumulation season precipitation are the key factors in glacier mass balance which translates to glacier terminus behavior. For the Boshula Mountains the main accumulation season is the summer monsoon, which is also lower on the glacier the main melt season. At Bomi 70 km west of the glaciers Wang and others (2011) note that summer precipitation has declined slightly since 1970 while summer temperatures have rise 1 C. It is the rising temperature that has been the key reason for retreat of the glaciers and consequent exposure of new lakes and expansion of older lakes at glacier termini. The frequent summer snowfall on the upper 60% of the glacier prevent surface soot from impacting ablation on the majority of the glacier. Solar radiation is highest during the summer, but soot deposits are at their lowest during the summer monsoon and are also buried over most of the glacier by new snowfall. 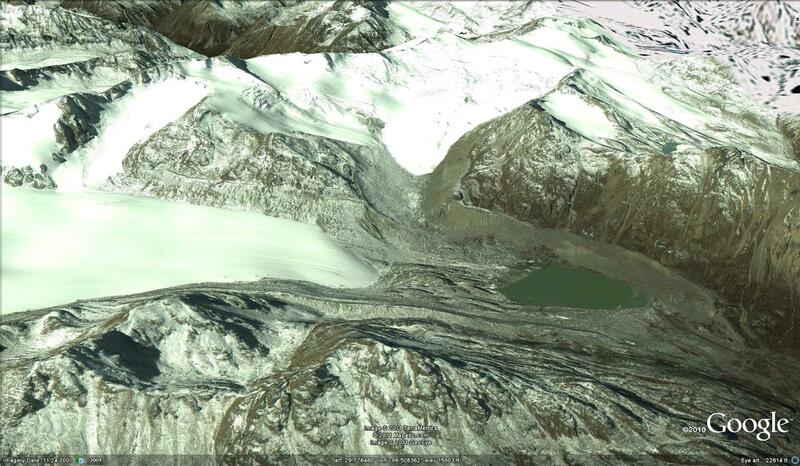 Fits with other Chinese glaciers with a trend becoming increasigly negative for mass balance leading to faster retreat after 1975 Ding and others (2006) The Bushula Range glacier that is focussed on here drains into the Salween River as does the 33, km long Laigu Glacier,seen below, one of the headwaters of the Salween. This entry was posted in Glacier Observations and tagged Boshula mountains glacier retreat, china glacier melt, Tibet glacier retreat. Bookmark the permalink.